(BPT) – When you think of your bathroom, what comes to mind? A place you’re in and out of quickly while getting ready for the day or winding down for the night? Your bathroom can be more than just a utilitarian space. Features like these cam also increase the desirability of your home. 1. Tantalizing tub features provide a peaceful paradise. Water has many therapeutic benefits, and with the right tub, you can enjoy any time you’d like. 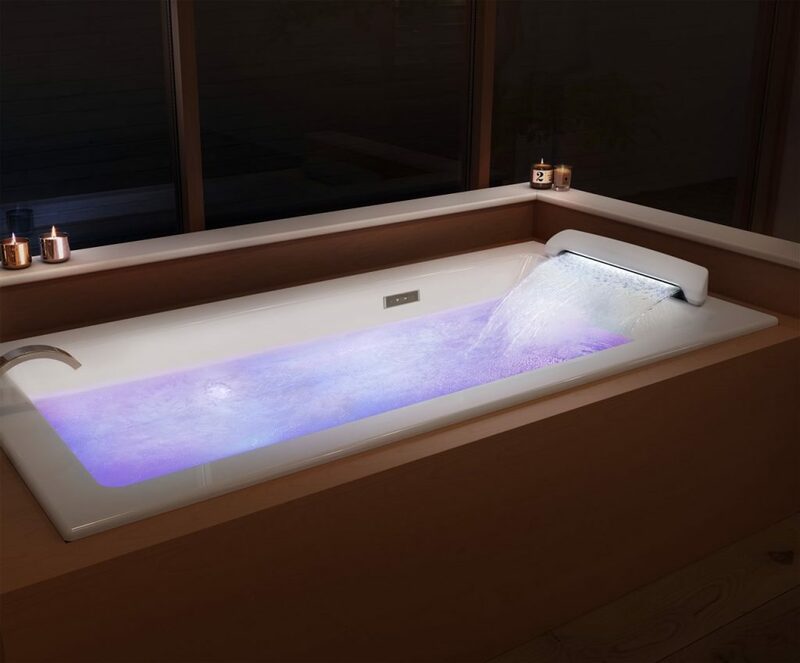 Relieve sore muscles and calm the mind with an air bath, a soothing bathtub option that uses thousands of tiny air bubbles to melt away the day. For instance, one product like the DXV Aqua Moment Drop-In Airbath with Waterfall provides a gentle shoulder massage that helps release tension, while the waterfall transports the mind to a peaceful paradise. Activate the chromatherapy to complete the ambiance; for example, choose purple to reduce anxiety or orange to boost energy. 2. Create coziness using heated elements. Warmth brings relaxation, so make sure your bathroom has all the features to keep you toasty. Consider adding heated elements underneath your flooring. Just imagine being able to adjust the temperature on a knob and warming the floor to your preferred level of comfort. A heated towel rack is a must-have and easy accessory to add. Flip the switch at the start of your shower or bath and by the time you get out, your towel will be warm as if you just pulled it out of the dryer. 3. Delight the senses with a distinctive shower experience. A shower can be much more than an opportunity to get clean. Modern shower heads offer an experience to delight the senses. For example, the Spectra eTouch shower head from American Standard allows you to choose from four distinct spray patterns with the simple tap of a finger on the wall-mounted remote. Select your spray pattern to jump-start your morning and another to relax at night after a busy day. 4. Enjoy a luxurious, clean feeling. It is important to pause and take time for yourself, you’ve earned it. Choose bathroom products designed to offer you superior cleansing and improve your well-being. You can add fixtures with self cleaning nozzles and toilets with heated seats. 5. Complete the experience with pampering accessories Add the extras you need to your bathroom to make it feel like a true spa retreat. Invest in a plush robe and slippers to make you feel relaxed. New loofahs and sponges, along with scented bath products, can make the experience extra calming and luxurious. Don’t forget to pick up some new, lavish towels that will wrap you in softness.After a long day at work, there’s nothing better for your body and mind than the ability to experience your own “five-star” spa treatment. Even better, you don’t even have to pack a bag or hop in the car now that you have a calming oasis right at home. This entry was posted in Real Estate on March 18, 2019 by Mike.